When it comes to wool Italian style suits that are true to quality, Statement is a brand that should be on your shopping list. That is because Statement believes that style and quality should form a synergy of expression that is tailored into a fine hand made suit. 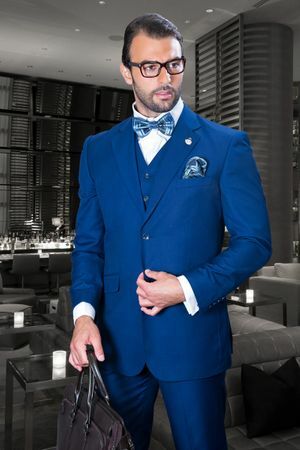 This bright sapphire blue 3 piece suit features a wool Italian fabric with style and has side vents in the back of the jacket and, stitched lapels and pockets and pleated pants with a regular fit for comfort. Made of Italian wool super 150s fine fabric.